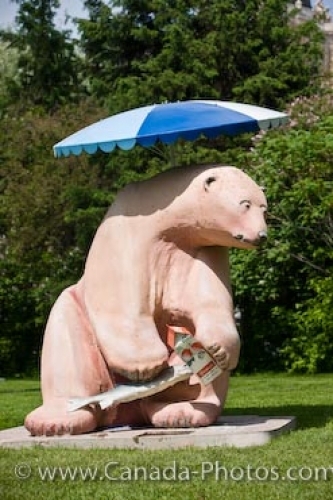 Shaded by his blue and white umbrella, one of the collection of bear statues in the "Bears on Broadway", this one named "Bear Necessities", adorns the grounds of the Legislative Building in Winnipeg City, Manitoba. Representing food, shelter, water and clothing as this is what every human requires to survive, the "Bear Necessities" polar bear statue holds onto a fish and juice to pass along this important meaning. Please let me show you more of my pictures from my "photo gallery: Winnipeg City Photos". Picture of the Bear Necessities statue on the Legislative Building grounds in Winnipeg, Manitoba. Pictures from photo gallery "Winnipeg City Photos"
These bear statues are visible to any one who wants to browse the grounds of the Legislative Building while in Winnipeg City. Polar Bear Statues in the "Bears on Broadway" collection in the Legislative Building grounds in the City of Winnipeg, Manitoba, Canada.